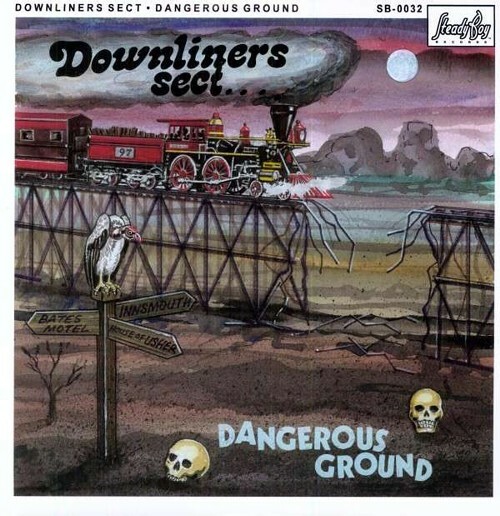 Downliners Sect - "Dangerous Ground"
I first discovered this long-running British rhythm & blues / freakbeat band when I heard two of their songs on the various artists 'Nuggets Volume 2 - Original Artyfacts' 4-CD box set a few years ago. I was amazed to see that the two founding members had put together a new album after all these years. From what I could tell, the last all-new LP these guys released appears to be 1979's 'Showbiz'. The cover for 'Dangerous Ground' was done by graphic artist and vocalist for short-lived British freakbeat band The Artwoods - Art Wood who passed on a few short years ago. He was Ron Wood's brother. Well, I must say that this comeback effort is certainly quite good, really - actually it shows that the musicians are still enjoying very much what they do. Tunes that manage to pull you right in are the wailing opener "Keep On Rocking", the just-as potent boot-stomper "Escape From Hong Kong", "In The Pits" (with Art Wood on vocals) keeps up the pace and "So Blue" (sort of maybe reminds me of the Grateful Dead). As I gave this CD a second spin, I got more out of the title track "Dangerous Ground", the traditional song about working a hard life "Working On The Railroad", the heart-felt "Quicksand" and "Daemon Lover" which makes for a good song to hear on the road. Actually, this entire CD is like that. Personnel: original members Don Crane - electric, acoustic and rhythm guitar & lead vocals, Keith Grant - bass & lead vocals with Paul Martin - harmonica, saxophone & backing vocals, Del Dwyer - lead guitar, slide guitar & backing vocals and Alan Brooks - drums & percussion. I wanted to note that if you like what you read here, there are two Downliners Sect compilation CD releases that have been out for a while now that I strongly recommend for anyone who enjoys British R&B as such - 'The Sect' + 'Rock Sect's In' a must-have 2-fer-1 of the band's first album ('64) and their third record ('66) and then there's the 'Definitive Downliners Sect - Singles A's And B's'. I believe both titles have twenty-nine tracks each. A real find. 'Dangerous Ground' should provide many enjoyable spins for old school fans and followers of the Pretty Things, the previously mentioned Artwoods, the Troggs, the Yardbirds, early Stones, The Master's Apprentices, Idle Race, The Birds and The Mojos.